AWS is known internationally to have documented the best practices, and the best way to test the skillset of several Job profiles involved in the engineering industry. When AWS tests and certifies a technician or an engineer, the international engineering community accepts the fact that this person is suitable for a particular job profile. So an AWS certification basically helps the candidate to widen the horizon where he can take up a job or assignment. BETZ Engineering & Technology Zone is a professional engineering services organization established in 2002 by a group of aspiring professionals with two decades of experience in the field of Inspection and Non Destructive Testing & Analysis. BETZ acts as quality analyst that conducts on-site and In-house Engineering Inspection Services for Automobile, Energy, Aerospace, Oil & Gas and Shipping. 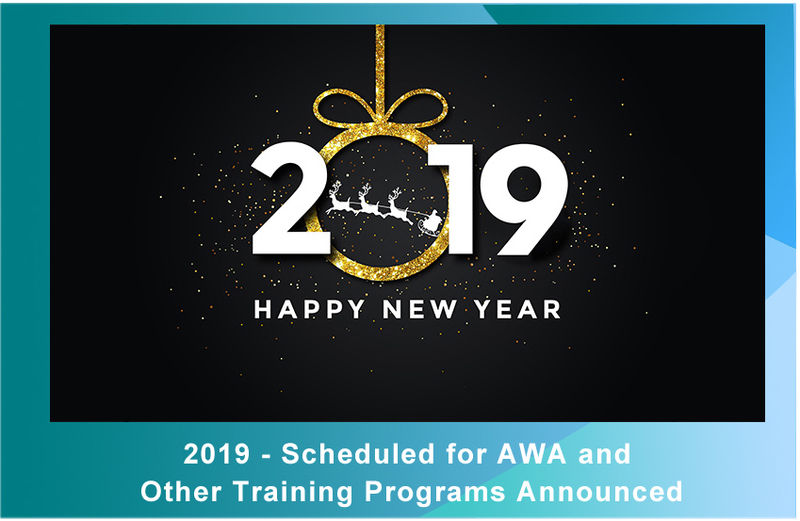 BETZ Research & training division is an authorized international agent for American Welding Society since 2007 to conduct seminars and exams for the requirement of AWS Certified Welding Inspector, Senior Certified Welding Inspector and Certified Welding Engineer Part # 1 & 2 . BETZ has produced more than 1800 CWI and all of them were deployed predominantly in Middle East and North American countries. 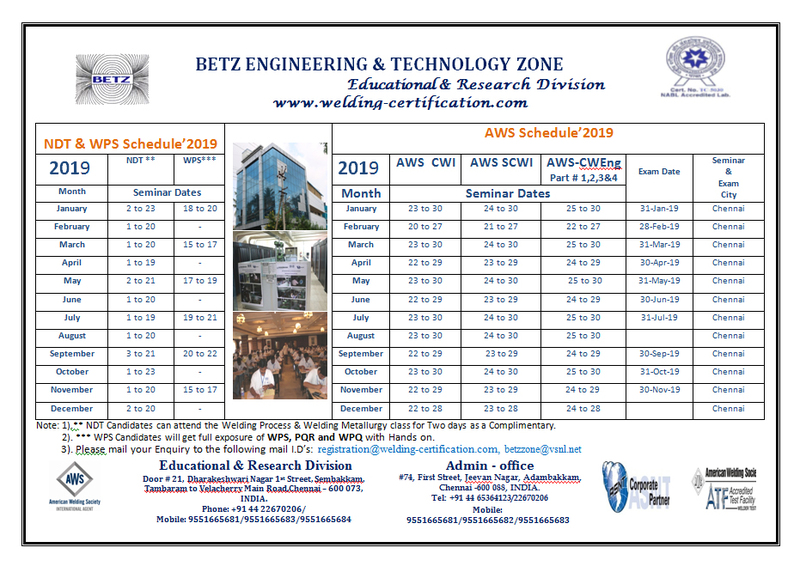 AWS - "Certified Welding Engineer "
BETZ Engineering & Technology Zone is an accredited International Agency for American Welding society, Florida, USA, to conduct seminars and certification programs for AWS in India and worldwide. BETZ is an ISO 9001:2008 company, also BETZ is the Only “ATF –Accredited Test Facility” by AWS to evaluate and certify welders in India. Individual with Bachelor of Engineering (B.E) and a minimum of one (1) year relevant experience. Individual with Bachelor of Technology (B.Tech.) and a minimum of two (2) years relevant experience. Individual with other related Bachelor of Science (B.S.c.) degrees and a minimum of five (5) years of relevant experience. Individual with an Associate in Applied Science (A.A.S.) degree and a minimum of ten (10) years of relevant experience. The AWS Certified Welding Engineer (CW Eng.) examination consists of four parts. Parts 1 and 2 must be successfully completed in order to take Parts 3 and 4. The first two parts (1 and 2) of the exam are closed book and covers basic science fundamentals and applied science fundamentals. Exam will be of two hours for each part with written type multiple-choice questions (total time of four hours). Part 1 is a 35 questions multiple choice exam and Part 2 is a 25 questions multiple choice exam. They are given together and must be passed together. If the candidate fails one part, only that part must be repeated. Exam for Parts 3 and 4 are open book examinations on welding related disciplines and practical welding and related applications. Each exam is three hours in length( Duration). Part 3 is a 45 questions essay exam. Part 4 is a 39 questions multiple choice exam. Candidates that successfully pass Parts 1 and 2 will be invited to sit for these exams and a separate application must be submitted to AWS. 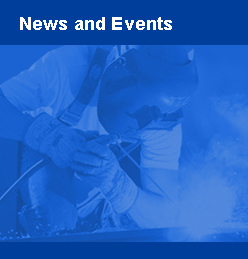 BETZ is an authorized international agent for American Welding Society since 2007 to conduct seminars and exams for the requirement of AWS Certified Welding Engineer, Certified Welding Inspector, Senior Certified Welding Inspector.